I'm looking at a SQL Server system with 4 NUMA nodes, 18 cores on each NUMA node. Total RAM: 2 TB. 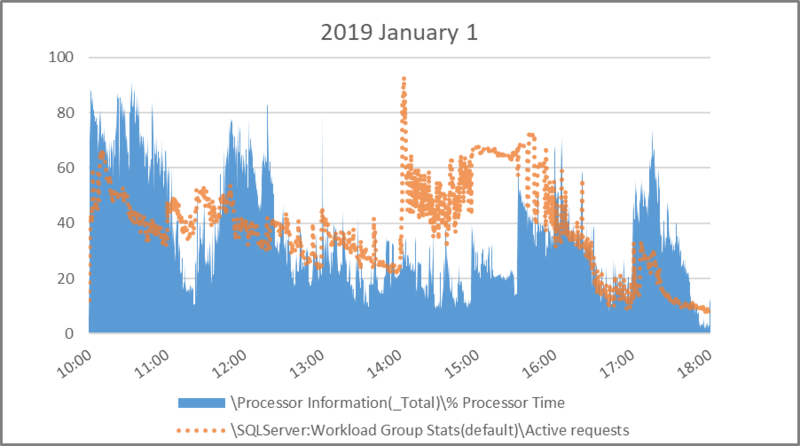 We can easily verify that the SQL Server default workload group is the main CPU consumer on the server. I like to trend active requests and parallel threads against CPU utilization. 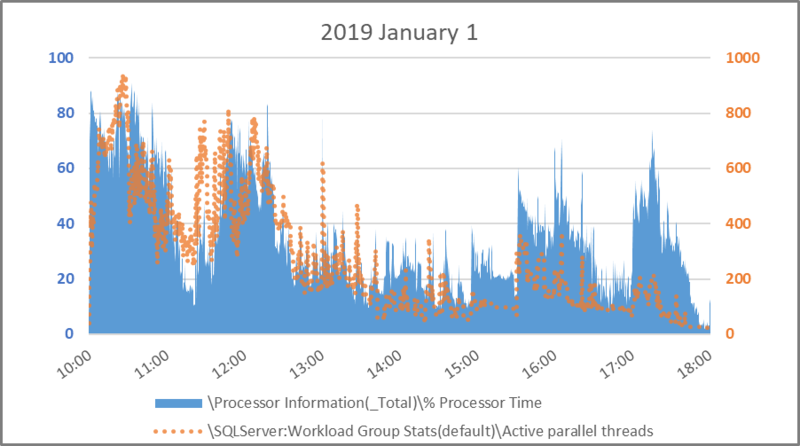 On the systems I watch, when they are healthy there should be a fairly strong correlation between CPU and requests, or CPU and parallel threads, or both. Hm. During this time, threads have a stronger correlation than requests. That's not concerning by itself. But with this many requests and this many parallel threads against 72 logical processors/schedulers (HT is not enabled), I want higher CPU utilization and a higher rate of work. 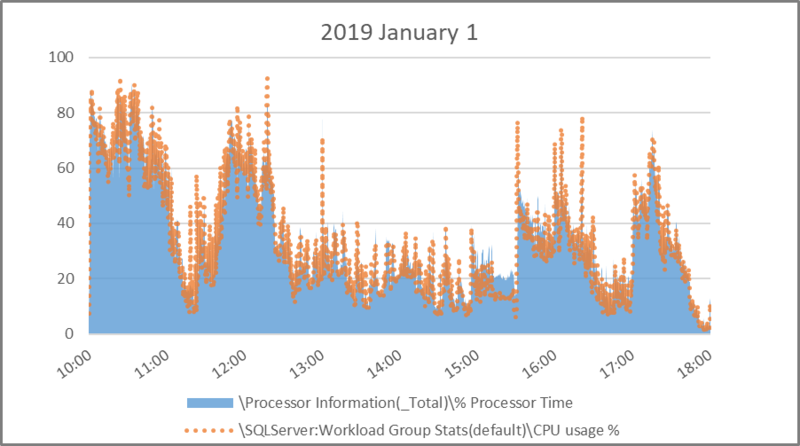 Either the work is poorly distributed (a less likely condition) or there is a wait type (or types) that can be identified as suppressing CPU utilization. Perfmon captures some wait types, and I strike gold by looking at resource_semaphore waits. I don't like switching between area and line graphs for resource utilization, but the graph below is easiest to read with CPU as a line graph over stacked area graphs of memory grants (pending and outstanding). 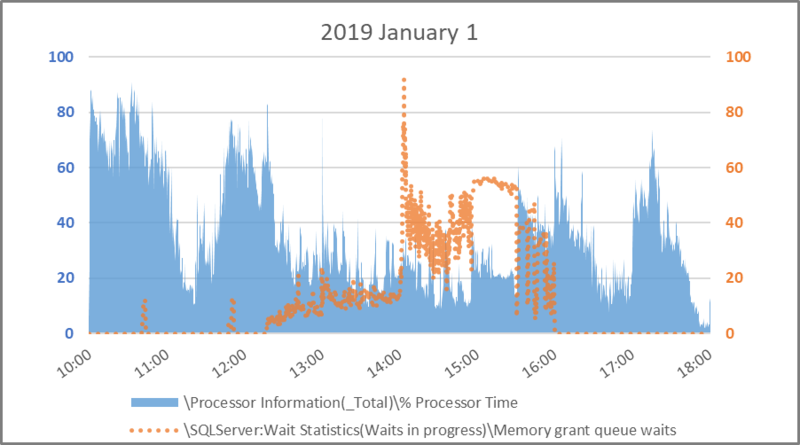 The point of this graph is to show if, at every point in time, the pending memory grants were converted to outstanding (so that the query was executing rather than waiting) there would be enough CPU to allow the queries to run. When I intervene on a system for scalability or performance, I hope not just to replace one wait type with another 😎. If, for example, CPU was near 100% utilized while there were pending memory grants, I'd expect simply to replace resource_semaphore waits with SOS_scheduler waits. But, that's not the case here. So I have in mind to lower the "Maximum Memory Grant %" for the relevant workload group. On this system, the default workload group is still using 25%. But there are lots of queries running on the system. Some of them are probably already spilling to tempdb. Those queries will spill more by lowering the max memory grant percent. And some queries that weren't spilling before but were close will start spilling into tempdb. 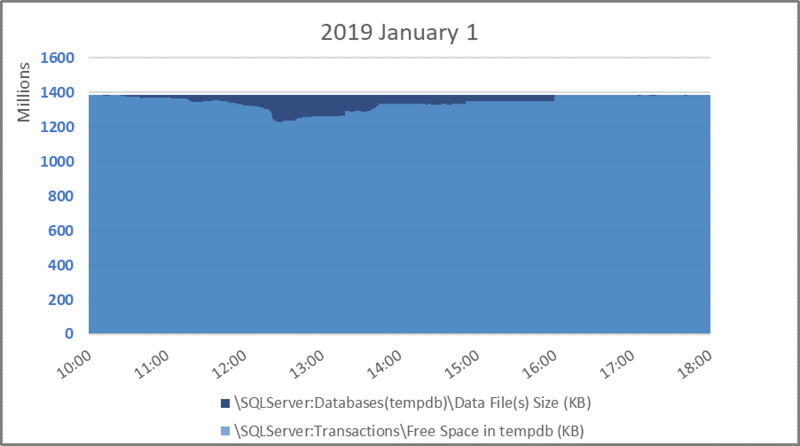 Let's look at how much tempdb was already in use. Perfmon has counters for the data file size in tempdb, and the amount of tempdb used. In the graph below the used tempdb is in light blue layered in front of the dark blue size of tempdb files. So the exposed dark blue at the top is the used tempdb. Let's do the subtraction for used query memory, and used tempdb. And stack them on top of each other. The upper border is the upper limit for sort/hash activity on the system at any given time. (Upper limit because "used tempdb" also includes temp tables, version store, etc). 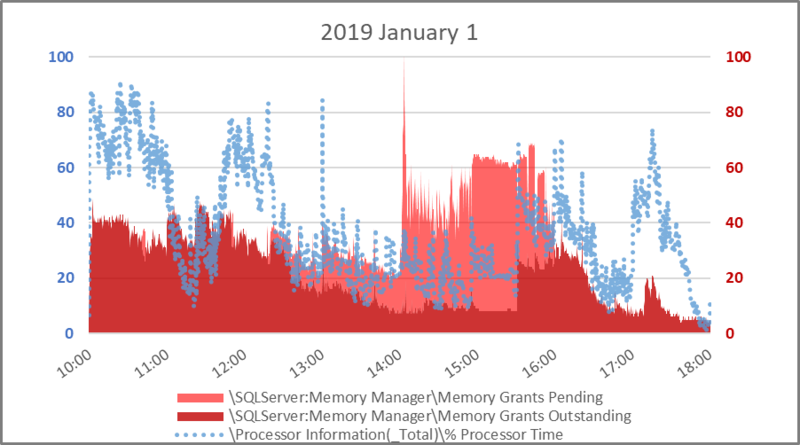 Assuming that all of the queries from 10:00 am to 6:00 pm ran with the same plans but with maximum memory grant percent at 6% rather than 25%, none of their sort/hash needs would change. Assuming the pace of every query remained the same, eliminating only resource_semaphore wait time (that's not realistic but work with me here 😇) the total area under the upper border would stay constant. Like moving tetris blocks around. 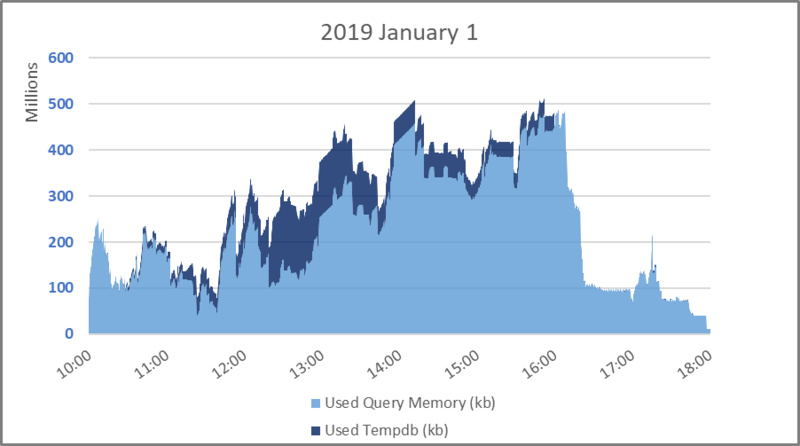 The share of tempdb is likely to increase vs used query memory. 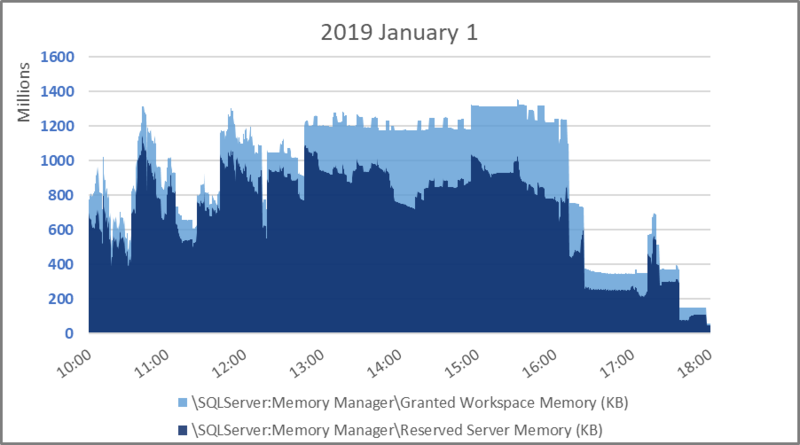 But it looks like bringing the maximum query memory grant percent down from 25% to 6% is going to be a win for this workload. After the change, I recommend doing the same type of analysis to make sure the behavior is as expected.